On July 4, 1976, the United States of America celebrated the 200-year, Bicentennial, anniversary of the adoption of the Declaration of Independence. On July 4, 1966, Congress created the American Revolution Bicentennial Commission which was tasked with deciding a single city in which to host the celebration, either Philadelphia or Boston, and planning the festivities. After six and a half years of heated debate they could not decide on a host city. The Commission was disbanded. On December 11, 1973, Congress created the American Revolution Bicentennial Administration which was tasked with encouraging and coordinating locally sponsored events. The Bicentennial came only one year after the American Army withdrew, defeated, from Vietnam and the Ford Administration stressed the themes of renewal, rebirth, and restoration of traditional values. The Bicentennial events began April 1, 1975, with the launch of the American Freedom Train from Wilmington, Delaware on a 25,388-mile tour of the contiguous states. On January 19, 1976, George Washington was posthumously named General of the Armies of the United States, Public Law 19-479, which was to take effect July 4, 1976. Independence Day was marked with parades, including a nautical parade of tall masted sailing ships in the Hudson River, museum exhibitions, and elaborate fireworks displays across the nation. 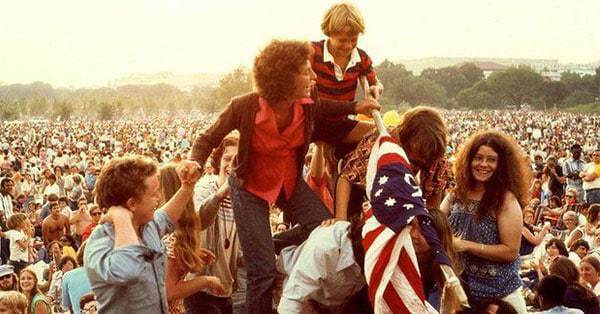 July 4, 1976, was a day of patriotic celebration that will be unparalleled until the Tricentennial. July 4th, 1976 – Bicentennial celebration in New York Harbor. Operation Sail. Steven Lindner.